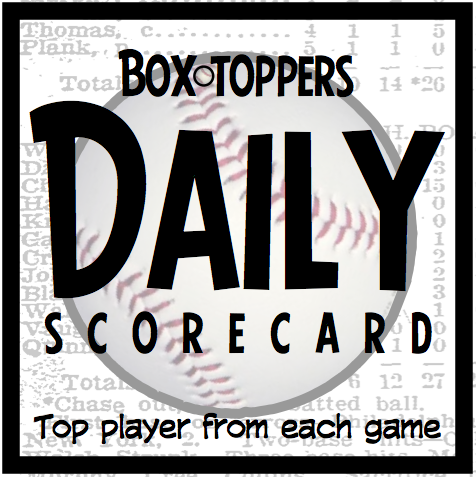 Yankees pitcher James Paxton is Tuesday’s Box-Toppers Player of the Day. Here are the top 10 players in Box-Toppers points (BTP) for the 2019 season through the games of April 16. Meanwhile, three players rise in Box-Toppers season player rankings top 10 list after earning Player of the Game honors Tuesday: Christian Yelich of the Brewers rises to third place, Cubs pitcher Jose Quintana rises to eighth place and Indians pitcher Shane Bieber rises to ninth place. Player of the Day—Paxton struck out 12 over eight scoreless innings, allowing two hits and one walk, in the 8-0 win over the Red Sox. Paxton earns 2.0 Box-Toppers points for being Player of the Day, his first of the season, and ranks 28th in season player rankings. Paxton had the most 2018 Box-Toppers points of any player to change teams in the offseason. He had 17.0 points with the Mariners, ninth among American League pitchers. National League Player of the Day—Cubs pitcher Jose Quintana struck out seven over seven scoreless innings, allowing six hits and no walks, in the 4-0 win over the Marlins. Quintana earns 1.7 Box-Toppers points for being NL Player of the Day, giving him 3.7 for the season, rising to eighth in season player rankings, third among NL pitchers. National League Batter of the Day—Christian Walker of the Diamondbacks homered and went 3-for-4, scoring twice and driving in two runs, in the 9-6 win over the Braves. American League Batter of the Day—Avisail Garcia of the Rays homered and went 2-for-4, scoring once and driving in three runs, in the 4-2 win over the Orioles. Rankings—Christian Yelich of the Brewers rises to third place in Box-Toppers season player rankings after earning Player of the Game honors Tuesday. Yelich (HR 2-5 R 3BI in the 8-4 win over the Cardinals) now has 4.5 Box-Toppers points for the season, second among NL batters, behind Cody Bellinger of the Dodgers (5.2). Tuesday was the second straight day Yelich earned Player of the Game honors. He was also Player of the Day Monday in the Brewers’ 10-7 win over the Cardinals. Yelich led NL batters in Box-Toppers points in 2018 with 11.5. Also Tuesday, Indians pitcher Shane Bieber rises to ninth place in Box-Toppers season player rankings after earning Player of the Game honors. Bieber (6IP 4H R 3BB 5K W in the 4-2 win over the Mariners) has 3.7 Box-Toppers points on the season and ranks fourth among AL pitchers. Streak—Justin Smoak of the Blue Jays has now earned Box-Toppers poitns in 10 straight seasons after earning Player of the Game honors Tuesday. Smoak (1-3 R 2BI in the 6-5 win over the Twins) earned his first Box-Toppers points in 2010 with the Mariners and now has 36.4 career points, 19th among active AL batters. His best season was 2017 with the Blue Jays when he had 6.5 Box-Toppers points, seventh among AL first basemen. In 2018, he had 6.0 points with the Blue Jays, third among AL first basemen. Scoring—Paxton earns 2.0 Box-Toppers points for being Player of the Day and Quintana earns 1.7 points for being NL Player of the Day. Walker and Garcia each earn 1.5 points for being their league’s Batter of the Day. All of Tuesday’s other Players of the Game (listed in the chart below) earn 1.0 Box-Toppers point.